Have a Schrodinger's cat follow your mouse cursor around. Is there a better alternative to Neko 2014? Is Neko 2014 really the best app in Entertainment category? 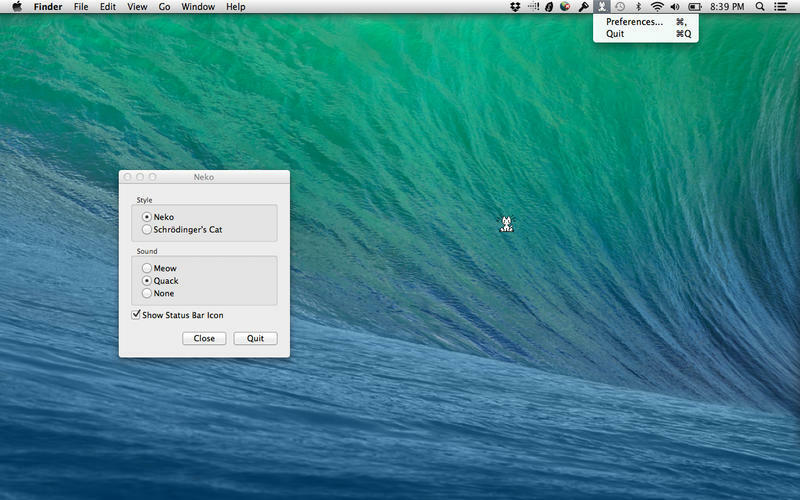 Will Neko 2014 work good on macOS 10.13.4? Neko 2014 would follow the mouse pointer around. When cat caught up with the pointer, it would stare at the screen for a few seconds, scratch an itch on its body, yawn, and fall asleep until the pointer was disturbed. In windowed mode, cat would stop at window boundaries and scratch at the edge of the window. Schrodinger's Cat will follow your pointer. When it catches the pointer it will turn into a box and then enter. There is a 50/50 chance of weather that cat will be awake or asleep after pointer is moved off the box. This is designed to be a simple amusing way to demonstrate Schrodinger's Cat thought experiment. Neko 2014 needs a review. Be the first to review this app and get the discussion started! Neko 2014 needs a rating. Be the first to rate this app and get the discussion started!